Kent Hartman’s new book The Wrecking Crew: The Inside Story of Rock N Roll’s Best Kept Secret (Thomas Dunne Books/ St. Martin’s Press) is the multi-fold biography of a group of musicians who found themselves at the center of the perfect storm during the heyday of Top 40 Radio. This loose conglomeration of players became the go-to sessioneers for West Coast music producers during the 1960’s. Phil Spector, Brian Wilson, Lou Adler all counted on them for their accurate and intuitive skills during recording dates. We all know the music they helped create, but who they were is looked at in depth, between two covers, here for nearly the first time. During the course of this history you’ll meet Bassists Carol Kaye and Joe Osborn, drummer Hal Blaine, guitarist Tommy Tedesco, and many others. People whose names you don’t know but whose handiwork you have probably loved for 40 years. For instance, do the names Louie Shelton or P.F. Sloan ring a bell? It’s Shelton’s key guitar lick that drives The Monkees’ “Last Train To Clarksville,” while Sloan’s twelve string filigree adorns the intro of The “California Dreamin’” by the Mamas and Papas. Others, like guitarist Glen Campbell, will be familiar. As one of the few “crew” members to rise to individual fame his biography is a cohesive thread throughout the book. Rather than delineate each player’s biography on a chapter by chapter basis or write the book as a series of interviews, Hartman intertwines their formative histories during the outset of the book. This makes for an interesting narrative as seemingly disparate occurrences coalesce to bring these folks together. A series of small serendipities and coincidences – we’d call it networking these days – ultimately converge in the recording studios of Los Angeles at just the right moment in time. We know what’s coming, but how it gets there – well that’s the entertaining part. As a “boomer”, a life long music collector, and a musician myself, I did not come to this book without prior knowledge of many the players and some of the stories. From the Wrecking Crew’s origins at Spector’s Gold Star Studio sessions, through Don Peake’s tenure as the only white player in the Ray Charles Orchestra and drummer Jim Gordon’s sad homicidal breakdown, Hartman affords a timeline and a series of vignettes that make sense of the often incongruous pieces. His new interviews with key players add fresh information and clarification of some of the previous apocrypha. 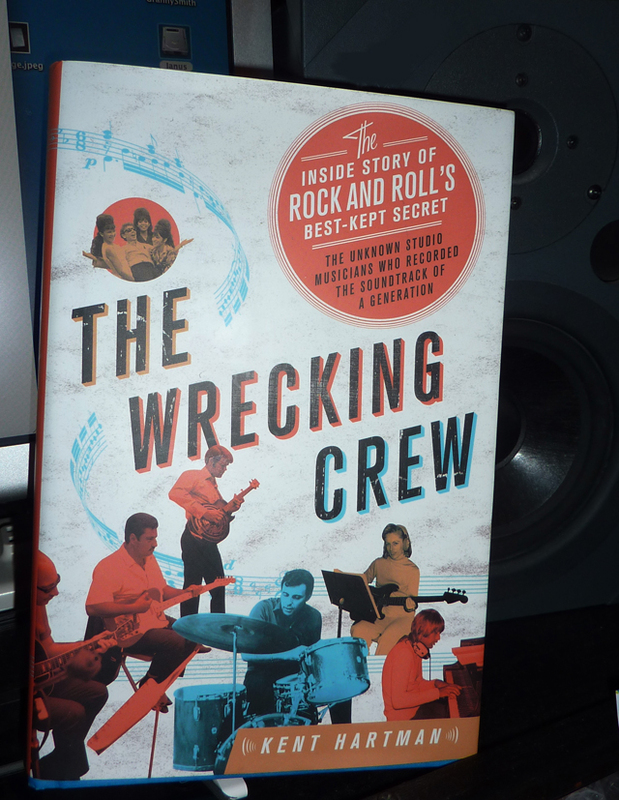 Highly recommended, The Wrecking Crew is a brisk read, filled with informational and inspirational anecdotes. Along with Always Magic In the Air, Ken Emerson’s Brill Building overview, it’s a book I’ll keep within quick reach as a reference.